Visita el Blog de MexGrocer.com para aprender mas sobre El Pan de Muerto en la Celebracion del Dia de Muertos. What would you do if someone invited you to a fiesta in a graveyard? Would you go? Or does the mere idea of it give you a major case of the creeps?! Well, you're not alone, amigo. In the USA we try to deny, cheat and minimize death. Not so in Mexico. In Mexico, the symbol of death is a grinning, fleshless beauty called La Muerte-Lady Death (La Catrina). An elegantly and colorfully clad skeleton wearing a flower-laden hat, created by press artist Jose Guadalupe Posada (1853-1913), she's an amazing metaphor of life embracing death. You can feel this in her name, for she goes by La Catrina-Fancy Lady, La Flaca-Skinny, La Huesuda-Bony and La Pelona-Baldy. There's humor here, not fear. What's up with that! "The word death is not spoken aloud in New York, in Paris, in London, because it burns the lips. The Mexican, in contrast, is familiar with death, chases after it, mocks it, courts it, hugs it, sleeps with it; it is his favorite toy and his most lasting love." How did nextdoor neighbors-the US and Mexico-develop such wildly divergent attitudes toward death And how did what was originally a pagan holiday survive the invasion of Catholicism History holds the answer to those questions. Dia de Muertos has its roots in pre-Columbian tradition where the people felt deeply connected to and lived harmoniously with the Earth. They viewed the cycle of life-conception, birth, growth, maturity, decline and death as part of a great and mysterious whole. Spiritually, rather than materialistically grounded, they felt themselves to be one with all that had ever existed or would exist-on this planet and in our universe. For these reasons, death didn't scare them, nor did they try to outsmart it. 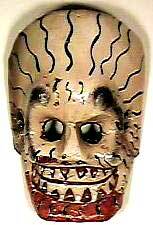 Although the holiday's exact origin is uncertain, it's believed that it began with the Olmecs about 3000 years ago. They saw life as an illusion and believed that in dying, human beings truly awakened and their souls were set free. The Olmecs transmitted their ideas to the Toltecs and Mayans in Central America, who later shared them with the Aztecs, Tlaxcaltec, Chichimec, Tecpanec and other Indians native to Mexico. When the Spaniards defeated the Aztecs in the 1500's, they converted the Indians to Catholicism. However, they encountered resistence when attempting to eradicate all native religious traditions. 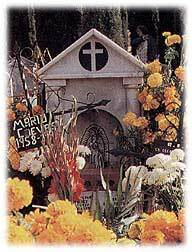 In a compromise sanctioned by the Church, Dia de Muertos was merged with two Christian holidays-All Saints Day on November first and All Souls Day on November second. This makes it a thoroughly unique, cross-cultural holiday, effectively blending two very different traditions. In that regard, it is symbolic of the Mexican people, for they are also a synthesis of the brown-skinned "people of the earth" and their white-skinned conquerors, the "people of the "sky"-as the Spanish were initially called. True to its roots, Dia de Muertos or Day of the Dead is a celebration, not of death but of the continuum of life. It consists of prayerful reflection, joy and revelry honoring those who came before. In a culture without written family trees, parents and grandparents pass stories on to their children. These aren't boring lists of names, facts and dates, but lively, humorous tales about those who came before. Their favorite foods, passions and possessions are discussed, along with their triumphs, their foibles and all sorts of other anecdotal details about their lives-forging a tangible, emotional link between the past and the present. 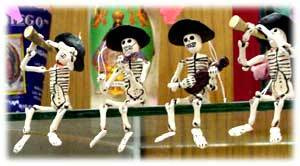 So now that we have a little background on the holiday-onward-to the graveyard fiestas, amigo! One more thing before we go. Be advised that there's no connection between Dia de los Muertos and Halloween whatsoever. This holiday is as important to Mexicans as Thanksgiving is to us. It's a time when people travel long distances to be with their families, some coming from as far away as the northern US. So-here we go! It's the last week in October in a rural Mexican village. Along the sides of the roads and in the open-air marketplace, homemade stands pop up. They're filled with pan de muerto - a special sweet bread with crossed bones on top (recipe follows article), amaranth seed skulls with raisin eyes and peanut teeth, candied Marzipan and chocolate skulls called calaveras, roasted corn or elotes, dancing skeletons or calacas carrying cardboard coffins, votive candles, and mountains of golden yellow marigolds-the flowers used to summon the spirits of the departed. By October thirty-first, we see altars springing up in every home. As we stroll down the cobblestone streets, we notice that the front doors are wide open. We see entire families joining together in decorating tables topped with wooden crates and lace table cloths. They're covered with marigolds or zenpasuchitl, along with the purchases from the street vendors. There's an abundances of candles, pictures of saints and photos of the deceased. In homes where there have been children who died, we see toys, balloons, pinatas. Even clothing and tiny pairs of shoes. Suspended from the ceilings are rectangular sheets of yellow, pink, Orange, blue and green papel picado-tissue paper with cutouts-that impart an airy feeling reminiscent of the sky at sunset. We inhale pungent, delicious aromas. The smell of the marigolds. The strong odor of copal incense, mixed with the chocolate-nut-and-chile aroma of mole and the earthy, meaty smell of tamales. We see pottery urns of mescal or pulque (native drinks made from cactus) and bottles of tequila. Our attention is momentarily diverted by a band of mariachis strolling down the middle of the sidewalk, playing, singing and laughing, followed by a troop of children. 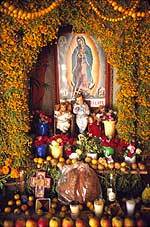 November first, All Saints Day is reserved for honoring the children, or angelitos. Early in the morning we head toward the local graveyard, where the family members are cutting down weeds, raking, touching up chipped plaster and repainting the tombs. Decorations are springing up here too. We see crosses made from marigold petals, elaborate multi-colored floral wreaths and artificial flower arrangements, along with more of the fruits, vegetables, goodies, photos, personal mementos and statues we saw in the homes. It's colorful. It's powerful. It's noisy. At 2:00 p.m. a hush falls over the crowd as the priest appears to conduct an open-air mass. Relatives huddle together, mourning their dead with la llorada-the weeping. It chokes every one of us up. At sunset, hundreds of candles are lit, mingling with the powerful scents of the food, incense and flowers. At midnight, the church bells begin to toll, summoning the dead. Many families will spend the entire night here, remembering their loved ones with recitations of the Rosary and praying that they will come and partake of the aromas of their favorite foods. On November second the entire village gathers in the cemetery for the big fiesta. It's packed. Every family has a picnic basket, plus beer and tequila for toasting the departed. Street vendors are selling tacos, tamales, shrimp and fruit cocktails, drinks and fireworks. Mariachis compete with one another and with the occasional radio blasting Mexican Ranchero music. At the close of the all-day festivities, multi-colored explosions light up the sky. Then the ancestors return to heaven and it's over until next year. To celebrate Dia de Muertos in your own home, try making an altar to honor and remember your ancestors. Then cook up some Pan de Muerto, some colorful Sugar Skulls and serve after a luscious, soulful, authentic meal consisting of Mole and Tamales. Some real Mexican tequila for slow, thoughtful sipping with this feast just might be in order too! In celebration of Mexico's Dia de Muertos, this pan de muerto bread is shaped into skulls or round loaves with strips of dough rolled out and attached on top to resemble bones. This recipe will take a little over three hours to make and will make four loaves. In medium saucepan, bring milk to a boil. Remove from heat and stir in butter or margarine, 1/4 cup sugar and salt. In large bowl, mix yeast with warm water until dissolved. Let stand 5 minutes and add to milk mixture. Separate yolk and white of one egg. Add yolk to yeast mixture, reserving the white for later. Add flour to yeast and egg, and blend well until a dough ball forms. Sprinkle flour over a pastry or cutting board. Place dough ball in center and knead until smooth. Return to bowl and cover with towel. Let rise in a warm place for about 90 minutes. After an hour, grease a baking sheet and preheat oven to 350F.Knead dough again on floured surface. Divide dough into quarters and set 1/4 aside. Roll remaining 3 pieces into "ropes." On baking sheet, pinch 3 rope ends together and braid. Finish by pinching ends together on opposite side. Divide the remaining dough in half and form 2 "bones." Cross and lay them over the braided loaf. Cover bread with dish towel and let rise for 30 minutes. Meanwhile, in a bowl, mix anise seed, cinnamon and 2 tsp sugar together. In another bowl, beat egg white lightly. After 30 minutes, brush top of bread with egg white and sprinkle with sugar mixture, except on cross bones. Bake at 350F for 35 minutes. Cool and serve. This is a great activity to do with kids, particularly if you explain the holiday to them and make a small altar in your home. The recipe takes less than an hour to prepare. You can do most of the work ahead of time, and then bring it out at the last minute. Then everyone can make their own skulls and paint them together! Sift powdered sugar. Mix egg white, syrup and vanilla in a dry, clean bowl. Mix sugar into wet mixture gradually. Mix with fingers until the mixture forms a ball. Use plenty of cornstarch when making skulls or other shapes. When the figures are dry, color them as you wish. While this recipe looks overwhelmingly difficult, it is not. It is truly a sauce to be made with loving care and to be served thusly to those you love. It is served at many Mexican holidays and special occasions. Makes 3 quarts and takes about 3 hours, but it's worth it! Serve with chicken (either cooked separately or browned in a little hot lard and added to sauce to finish braising) and sauted sliced plantains. Mole is also good with turkey or beef. Can be stored, tightly covered, in the refrigerator for about 10 days or indefinitely in the freezer. Rinse chiles under cold running water, removing seeds, tops and veins. Cover with boiling water and let soak until softened, no more than ten minutes, while you prepare the spices. Drain and set aside. Heat a small, heavy skillet over medium-low heat. Add peppercorns and cloves; toast, shaking the pan and stirring constantly, until their aroma is released, about one minute. Set aside in small bowl. Lightly toast the cinnamon in same pan for about a minute; add to the pepper and cloves. (If using ground cinnamon, do not toast; just add to other spices when you've finished toasting them.) Toast oregano in same pan until fragrant and add to spices. Set aside while you prepare nuts. In a heavy, medium-sized skillet, heat 2 to 4 tbsp lard or oil over medium heat until rippling. Add sesame seeds and cook, stirring, just until golden, about 3 to 4 minutes; do not let them darken. Remove to a medium-sized heatproof bowl. In the same pan, cook peanuts in same manner, stirring, until lightly browned, adding a little more lard. Add to bowl with sesame seeds. Cook slivered almonds, then pecans or walnuts in same way, using a little more lard each time and adding toasted nuts to sesame seeds and peanuts. Set aside. Combine raisins, prunes and apricots in a bowl and pour hot sherry over them. Set aside to soften. Heat butter or lard in a medium-sized skillet over medium heat until hot and bubbling, then add plantain slices and cook, stirring, until golden on both sides. Set aside. Heat griddle or cast-iron skillet over high heat until a drop of water sizzles on contact. Place unpeeled garlic and onion on griddle and roast, turning several times, until onion is blackened on all sides and garlic is dark brown and somewhat softened. Let cool slightly. Peel onion and garlic; coarsely chop the flesh of the onion. Set aside. On same griddle, roast tomatoes, turning several times, until blackened on all sides. Place in deep bowl to catch juices. Let cool slightly and peel. Drain canned tomatillos and set aside. Now you are ready to puree ingredients in sequence, working in batches according to the capacity of your blender and adding chicken stock as necessary to facilitate blending. Place as many of drained chiles and toasted spices in the blender as it can accommodate, with about 1 cup of chicken stock. Process until smoothly pureed, adding more stock if necessary. Repeat with remaining chiles and spices. With a medium spoon, force puree through a medium-mesh sieve into a bowl; discard whatever won't go through. Scrape puree into a large, heavy saucepan; rinse out the blender to wash away any hard or fibrous bits. Puree sesame seeds and nuts in several batches with just as much chicken stock as necessary to help free the blades. Add to chile puree. Puree dried fruit and sherry along with sauted plantain in same manner, adding a little stock if necessary. Add to saucepan with chiles and nuts. Puree onion, garlic, tomatoes and tomatillos. Add to other purees in saucepan, along with chocolate. Bring sauce to a boil over medium heat, stirring constantly. Reduce the heat to medium-low and simmer, uncovered, stirring often, for 30 minutes. This is a basic, easy recipe for Tamales. There are so many variations on these you would be amazed. While they are traditionally wrapped in corn husks, you can also wrap them in banana leaves. They can be made with most any kind of meat or vegetarian filling. You can even make fruit tamales for dessert! (Link to tamale cookbook perhaps?) You can make these ahead of time-even a few days ahead of time. They refrigerate well. Be sure to begin steaming them about an hour before you're ready to sit down and eat. This delicious recipe t will delight your friends and family. Be sure to serve with some salsa fresca on the side for those who love to spice things up a little! Serves eight. Combine masa and baking powder in large mixing bowl. Mix in broth. Beat shortening in separate bowl with electric mixer until slightly fluffy. Add to masa mixture and beat until it develops a somewhat spongy texture. Early in the morning, place the roast and water into a large pot or crockpot and slow cook four to six hours, or until it shreds easily with a fork. Remove the meat from pot. Place in large bowl, add salt and shred, reserving broth for the masa and the filling. Remove the seeds (using gloves so you don't burn your eyes!) and stems from chiles. Boil in a pan with one cup water for about five minutes. Transfer chiles to food processor and add cumin, pepper, garlic and enough of the chile broth to make a paste when all spices are blended together. Add spice paste to shredded beef and mix thoroughly. Add as much of the remaining broth as necessary to make a delicately moist, but not watery filling. Now comes the fun part. Divide the masa into 16 balls. 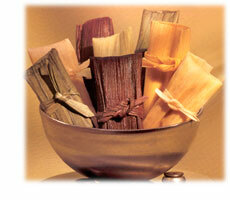 Open up the corn husks and tear 16 1/4 inch wide strips off husks for typing up the tamales. Lay a corn husk on your counter and pat dry with paper towel. Place a ball of masa on it and flatten into a square shape. Put a heaping spoonful of filling inside.Pick up the two long sides of the husk, fold them over into the middle and enclose. Roll the flaps of the husk in the same direction around the tamale. Fold the small, pointy bottom end up to close off the bottom and secure the tamale by tying it up in a bow. Repeat for all 16 tamales. Learn more about Day of the Dead Celebrations in Mexico with some other videos and interesting products that you can get for Dia de Muertos Celebrations.